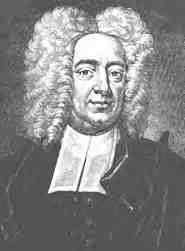 Cotton Mather, the minister of Boston's Old North church, was a true believer in witchcraft. In 1688, he had investigated the strange behavior of four children of a Boston mason named John Goodwin. The children had been complaining of sudden pains and crying out together in chorus. He concluded that witchcraft, specifically that practiced by an Irish washerwoman named Mary Glover, was responsible for the children's problems. He presented his findings and conclusions in one of the best known of his 382 works, "Memorable Providences." Mather's experience caused him to vow that to "never use but one grain of patience with any man that shall go to impose upon me a Denial of Devils, or of Witches." As it happened, three of the five judges appointed to the court of oyer and terminer that would hear the Salem witchcraft trials were friends of Mather and members of his church. Mather wrote a letter to one of the three judges, John Richards, suggesting how they might approach evidentiary issues at the upcoming trials. In particular, Mather urged the judges to consider spectral evidence, giving it such weight as"it will bear," and to consider the confessions of witches the best evidence of all. As the trials progressed, and growing numbers of person confessed to being witches, Mather became firmly convinced that "an Army of Devils is horribly broke in upon the place which is our center." On August 4, 1692, Mather delivered a sermon warning that the Last Judgment was near at hand, and portraying himself, Chief Justice Stroughton, and Governor Phips as leading the final charge against the Devil's legions. On August 19, Mather was in Salem to witness the execution of ex-minister George Burroughs for witchcraft. When, on Gallows Hill, Burroughs was able to recite the Lord's Prayer perfectly (something that witches were thought incapable of doing) and some in the crowd called for the execution to be stopped, Mather intervened, reminding those gathered that Burroughs had been duly convicted by a jury. Mather was given the official records of the Salem trials for use in preparation of a book that the judges hoped would favorably describe their role in the affair. The book, "Wonders of the Invisible World," provides facinating insights both into the trials and Mather's own mind. When confessed witches began recanting their testimony, Mather may have begun to have doubts about at least some of the proceedings. He revised his own position on the use of spectral evidence and tried to minimize his own large role in its consideration in the Salem trials. Later in life, Mather turned away from the supernatural and may well have come to question whether it played the role it life he first suspected.